This week Russia’s physicist Valentin Danilov may be freed on parole if the Krasnoyarsk court ruling requesting his release is not appealed. Danilov was convicted in 2004 of spying for China. If the court ruling is not appealed within the next ten days, the physicist will be released three years and two months before the end of his sentence. “The court just ruled in favor of the petition to release Danilov. The physicist will not have to serve the remainder of his sentence — three years, two months and 11 days,” said Maria Fomushina, press secretary for the district court in Krasnoyarsk. Kommersant reported on Fomushina’s announcement, which was made on Nov. 13. According to Fomushina, Danilov had earned five rewards and four penalties while serving his sentence. By the time his petition for parole was up for review, his four penalties had been canceled. The court ruling will come into effect in ten days, if it is not appealed. Fomushina noted, however, that an appeal is unlikely, since the application for parole was supported by the prosecutor. Russian human rights campaigners welcomed the news of Valentin Danilov’s release on parole. Lev Ponomaryov, leader of the For Human Rights movement, was also elated by the report of Danilov’s release on parole. “This is the most important news for me. I’ve been living with happiness in my heart since I heard this morning. We’ve been working for his release all these eight years,” said Ponomaryov. The human rights activist added that he considered Danilov’s conviction unjust, pointing to the fact that a jury had originally acquitted Danilov of all charges. Danilov was “never a spy,” said Ponomaryov. A criminal case was opened against Danilov in May 2000 by the local FSB office in Krasnoyarsk. Danilov, who headed the Thermo-Physics Center at Krasnoyarsk State Technical University at the time, was accused of selling sensitive information to colleagues at the China Academy of Space Technology. In February 2001, Danilov was arrested and placed in pre-trial prison. He was released on September 27, 2002, on the condition that he agreed not to leave his place of residence. 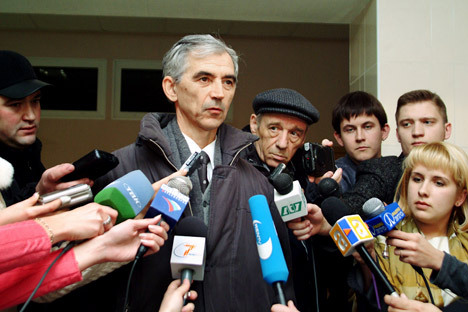 On December 29, 2003 a jury acquitted Danilov of all wrongdoing and pronounced him innocent. However, in January 2004, the local prosecutor sent an appeal to the Russian Supreme Court, which returned the case to the court in Krasnoyarsk for review. On November 5, 2004 another jury delivered a new verdict that found Danilov guilty of treason and fraud. On November 10, 2004, Valentin Danilov was arrested in the courtroom. The local prosecutor’s office said that Danilov had continued to divulge state secrets (he had given an interview to the Los Angeles Times) and had twice violated his pledge not to leave his place of residence. Two weeks later, Danilov was sentenced to 14 years in a strict regime (medium-maximum security) prison. In 2005, the Supreme Court reviewed Danilov’s case and reduced his sentence by one year. 1. In 2000, Moscow City Court sentenced American businessman Edmund Pope to 20 years in a strict regime prison. That same year, Russian President Vladimir Putin pardoned the spy, who was reportedly sick with cancer. 2. In 2003, a Moscow district court convicted Alexander Zaporozhsky of unlawfully collaborating with the special services of the United States and sentenced the former colonel in the Foreign Intelligence Service to 18 years in a strict regime prison colony. 3. In 2004, after a group of five military men and civilians sold secret information about Su-27 fighters to Chinese intelligence, they were sentenced by a court in Primorskiy Territory to various terms (ranging from 10 years to 15.5 years) in strict regime prisons. It later turned out that the spies had relayed information that China had already obtained earlier from Rosoboronexport by legal means. 4. Yet again in 2004, Moscow City Court sentenced Igor Sutyagin, then head of the subdivision for military-technical and military-economic policy at the Institute for U.S. and Canadian Studies (Russian Academy of Sciences), to 15 years in prison. Sutyagin was convicted of passing secret information about new types of arms to the British firm Alternative Futures. 5. In 2006, a Moscow district court sentenced Sergei Skripal, a former colonel in military intelligence, to 13 years in prison. Skripal worked for Britain’s MI6 for nine years, during which he betrayed dozens of Russian agents. Article based on materials from Kommersant and RIA Novosti.